Adam counting scales offer a fast and effective alternative to time consuming manual counting processes and are perfectly suited to stocktaking and inventory control tasks. With a choice of sizes, capacities, readabilities and features, Adam counting scales are fully equipped to accommodate counting, check counting, filling and checkweighing needs. Parts counting functionality can quickly and accurately count screws, electronics and other parts, saving time in manufacturing applications and reducing waste when filling containers. 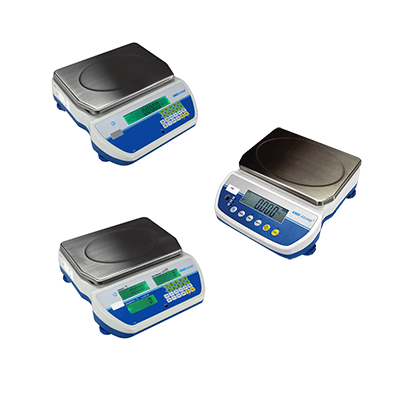 Simple to use, our digital counting scales are available with a single display, or with three displays to simultaneously show unit weight, count and total weight. Adam also offers dual counting scales, which maximise efficiency by allowing the use of a second auxiliary platform when counting large quantities. The GC counting indicator is ideal for parts counting tasks. Its numeric keypad facilitates unit weight and sample entry, while the display shows unit weight, total weight and number of pieces.